As children’s advocates, we’re frustrated by the seemingly constant attacks on our children coming from presidential candidates. In the last couple of weeks, candidates from both parties have disparaged child refugees, threatened to deny constitutional rights to American children, and tear families apart by deporting U.S. citizen kids. Tell the presidential candidates that our children are a priority to you and your vote. In fact, the first time any presidential candidate spotlighted a children’s issue other than education, it was Donald Trump’s immigration plan to deny Constitutional rights to children born in the United States, a policy to demolish the Fourteenth Amendment many candidates have now said they support. We’re shocked. And we’ve had enough. 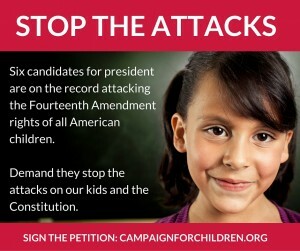 Join us in demanding Donald Trump and other candidates stop attacking our children. It takes just a minute to add your name to the petition.